Mangaluru, Oct 7,2017: Hanumantharaya who has been serving as Deputy Commissioner of Police (Law and Order) in Mangaluru City Commissionerate limits has been appointed as Deputy Director of Enforcement Directorate in Bengaluru. The officer has been relieved of state government service and posted for central deputation for three years. 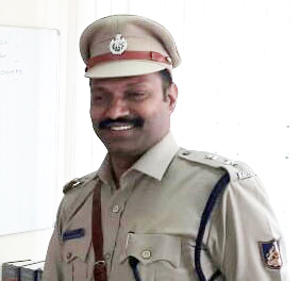 Hanumantharaya who was serving as DCP since June this year, was elevated to IPS grade the very next month. Prior to serving as DCP( Law and Order), he was DCP(Crime and Traffic) in City Police Commissionerate. These days the Police officials are shifted so commonly it is confusing for the people to remember their names .